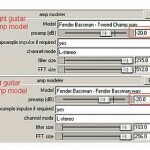 In audio mixing using Reaper Digital audio workstation; one of the most effective techniques that you should know is how to use the Reaper FX Chain. This would let you apply effects quickly and efficiently without going through the entire process of resetting and re-assigning settings for each of your track. Let’s illustrate how to do this with your Reaper DAW. Since you have two lead vocal tracks, you would most likely applying the same effects on them; so Lead vocal 1 and Lead vocal 2 will have to use the same vocal effects. Using Reaper FX chain technique, you will formulate the effects first on the first lead vocal track, and then test it. 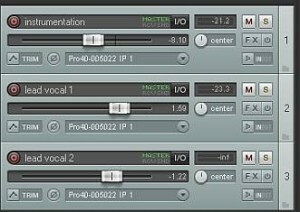 If it sounds good; you can then save it as an effects chain and use it on your second vocal track without the need to define the settings again. This saves time and improves efficiency in your Reaper audio mixing process. 1.) You will need to formulate the FX chain on the first lead vocal track. Click FX button. 2.) 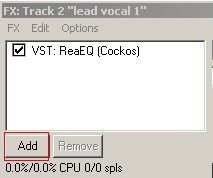 Let’s start by adding an EQ effect, on the plug-ins select “VST: ReaEQ (Cockos)”. The purpose of the EQ is cut the bass parts of the vocals (not needed) and then boosts the mid-frequency presence to improve lyrics clarity. A slight high-end frequency boost is to improve the vocal ambiance and presence. For other instruments (guitars, bass, drums), you can refer to this guide on the complete EQ settings to start when doing audio mixing.